This year, we were super excited to participate in and raise awareness for Rare Disease Day! Being this is our first year, we wanted to do something extra special and fun to bring the community together for a good cause. 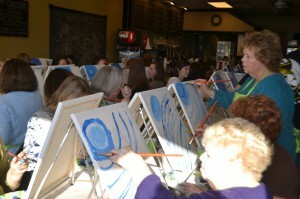 In conjunction with Cullen’s Crusaders and the Crazy Crepe Cafe, we help our ‘Painting For A Cause’ event! 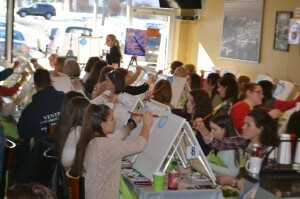 On February 28th the Paint Nite crew came to the Crazy Crepe Cafe in Lake Ronkonkoma and guided us through a canvas acrylic painting! There were 53 people in attendance, so it was definitely a packed house. We painted a gorgeous cherry blossom! We also held a raffle with various gift baskets up to grabs! Between Paint Nite’s donation and the money from the raffle, we raised $1,400 for Cullen’s Crusaders!! We far surpassed our $1,000 goal. Thank you so much to all who were in attendance, and were generous enough to participate in our raffle. The support of the community was a beautiful sight. All money and donations from the event benefited Cullen’s Crusaders, a local non-profit raising awareness for ALS.